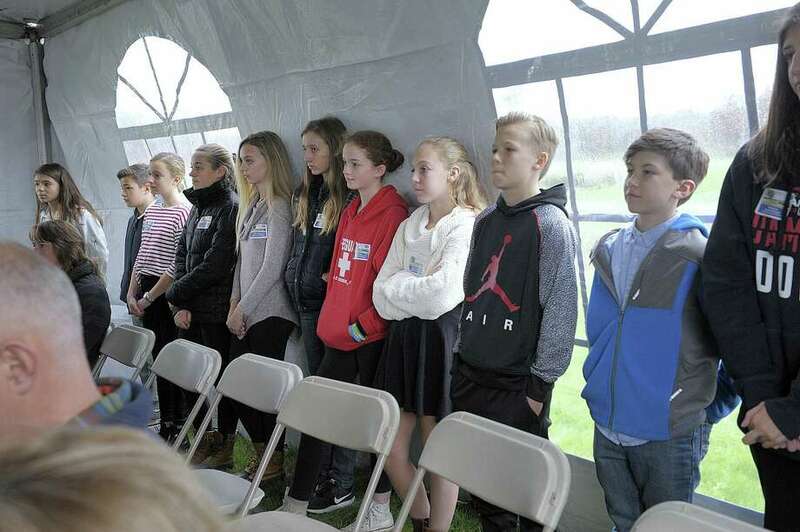 Students listen to speakers at Friday’s groundbreaking ceremony Nov. 9 at Shepaug Valley School’s agriscience and science lab renovation and construction project. WASHINGTON — The long-awaited agriscience academy is underway, with construction beginning last week. The program, which opens next fall, will teach area students about agriculture with a STEM focus, which includes science, technology, engineering and math. It is expected to include 35,750 square feet of new construction at Shepaug Valley School while also using unused space within the school. Bennett sees the groundbreaking as a celebration of this work. The project has been controversial at points, with some residents questioning if the costs were too high for the towns to absorb. Proponents tout the program though as a way to bolster declining enrollment. Staging for the construction began last week and bids were awarded in late October. O & G Industries is still serving as construction manager throughout the work, just as they did during the demolition phase, which was done over the summer. The project is expected to cost $30 million, with the state paying nearly $24 million. The state also awarded an additional $1.5 million to the district in the spring to purchase furniture and fixtures for the project. The school is renovating the science labs, bringing the total cost to about $34 million. Some of the project details include adding a greenhouse, an agricultural mechanics facility and animal facilities. Bennett said the work is split between the north and south ends of the building, “leaving the belly of the building intact and business continuing as usual.” Work will start by the main entrance and pool. She said the first phase of construction is slated to end next September and the second phase will wrap up by January 2020. “We fully recognize the building will not be 100 percent completed when we open the doors ... but the program will be up and running,” Bennett said. School officials have already organized the school around the affected classrooms and created a traffic and parking plan to avoid the construction. Updates are posted on the Shepaug website and extra staff are helping out with the traffic. The construction may affect pool access, so people should look for updates on the work. The campus will also be closed next summer so the workers can push the project forward as fast as possible. The program will serve 139 students from Region 12, Danbury, Brookfield, New Fairfield, New Milford, Newtown and Sherman. Bethel has not committed to joining the program.